The Governor who was on his way to Abuja got to the Akilubu village around 3:40pm, sighted dozens of vehicles parked by citizens alarmed that kidnappers were ahead. After the clearing the road, Governor El-Rufai directed that travelers who had been wounded by the criminals be rushed to the nearest hospital. 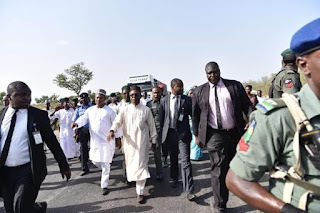 The Governor also directed security agencies to intensify patrols and permanently clear the road of the bandits.